I have a set of brand new NYX eyeshadow palette to giveaway. Because I am so considerate (lol jjk), I have carefully select the palette that has more useful colors and I got you guys the Champagne and Caviar set from the Runway Collection. Of all the palettes that are available, I really love this one. The colors are somewhat similar to Urban Decay Naked palette. I could have gotten you guys the Naked palette, but business on this blog is not that profitable. Maybe next time. For now, I can only afford NYX, which is not a bad thing. 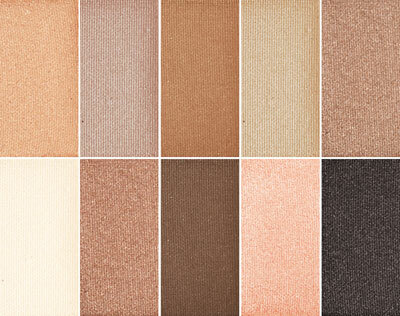 The eyeshadows are really creamy and pigmented. It lasts for more than 10 hours without primer. And the colors are all neutral colors so they're perfect for everyday wear. You guys have to help me to get 50 followers, that is I need to have 50 followers on Google Connect on this blog before I randomly draw a winner. Follow this blog on Google (On the right bar click "Join this Site"). What if you don't have a Google account? Go get one! If you already followed this blog then proceed to comment. Also, if you have a fashion and beauty blog, leave your link in the comment. I would love to check them out. Sit back and wait until I reach 50 followers. Or you can ask your friends, sisters, aunties, cousins and everyone to follow this blog to expedite the drawing of winner. I have the right to replace the item with something else of the same value. I just ordered this and it's on its way. Well, just in case there's any defect when it arrives or it doesn't arrive at all. Open to all readers whether you're from Malaysia or other countries. Unless you're from other planets then I don't think I can afford the shipping. I will randomly draw a winner from the names on the comment. If you don't comment but following this blog then I would assume you're not interested in participating. Once I hit 50 followers, I will draw the winner immediately and announce the winner on this blog. Winner will have to contact me. This gift is 100% sponsored by my own pocket and not affiliated to NYX marketing in anyway. Wow! That's lovely palette! Followed your blog..
See ya around, take care! not much of a beauty and fashion blogger but definitely a blogger of all sorts on things that I fancy"
Pick me I really very love this!!! !